To most people the classic diamond is a sparkling round brilliant gem, but as you have been learning there is much more to a diamond than what meets the eye. Let us now introduce you to the varying shapes that diamonds can be carved to form. A cutter's skill will produce a diamond shape of the greatest carat weight with the least visible flaws and the most brilliance and fire. All diamond shapes other than round are referred to as "fancy shape" diamonds. 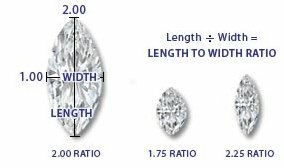 When looking at fancy cut diamonds, evaluate the length-to-width ratio. Although look is subjective, too long or too short proportions of the stone can look awkward. Make sure that the diamond is appealing to your eye and that it is symmetrical. One-half of the diamond should be shaped exactly as the other half. 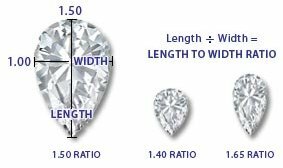 Girdle widths will vary much more on fancy shape diamonds, especially on marquise, pear, and heart shapes, where the girdle tends to be thick at the tips of the stone. The beauty of buging GIA graded diamonds is that The Gemmological Insitute of America has documented all of these diamond details and proportions in the grading report, so you can trust you are buying exactly the diamond specifications you are wanting. The round brilliant cut diamond is by far the most popular and most researched diamond shape available today. For almost 100 years, diamond cutters have been using advanced theories of light behavious and precise mathematical calculations to optimize the fire and brilliance in a round diamond. In addition to being the most popular a round diamond will typically give you more flexibility in terms of balancing cut, color, and clarity grades whilst still getting the fire and brilliance you want because the round brilliant have so many forgiving facets that help to mask the natural inperfections. The princess cut is called a square or rectangular modified brilliant in GIA grading reports. Although a relatively new cut, it is our most popular fancy shaped diamond and often finds its way into solitaire engagement rings. Because of its design, this cut requires more weight to be directed toward the diamond's depth in order to maximize brilliance. It may have either 50 facets (21 crown, 4 girdle, 25 pavilion) or 58 facets (21 crown, 4 girdle, 33 pavilion), depending on how the pavilion is cut. Princess shapes of high cut quality usually have a table percentages between 66-74% and a total depth percentage between 64-75%. Colour may be slightly more visible in the corners of the princess diamond, so when selecting the colour of your princess this may be something you want to consider. For a square princess, look for a length-to-width ratio between 1 and 1.05, which will look perfectly square. Whatever the proportions of your diamond, if you love the appearance, you have chosen wisely. The emerald cut does not have the facets of a brilliant cut, and is instead a step cut. Step cuts resemble stair steps, which act like mirrors. The emerald cut has 58 facets, with 25 crown, 8 girdles and 25 pavilions. Because of the angle, size and shape of the facets, the emerald cut may show less brilliance and fire (dispersion) than the other brilliant and modified brilliant cut diamonds. However, the emerald cut stone reveals a classic and artistic elegance and beauty not seen in other cuts. Because of the open and large, step facets, we recommend that you stay at a higher colour (D-G) and clarity (IF-VS2) grades than you might with brilliant cut stones. The emerald cut offers a touch of regal elegance as the center stone in a ring, and the most attractive proportions are a length-to-width ratio range of 1.30-1.65:1.00. The oval shape is an even, perfectly symmetrical design popular among women with small hands or short fingers. Its elongated shape gives a flattering illusion of length to the hand. It features a brilliant style of cutting very similar to the round brilliant, except it is elliptical. The oval is most frequently cut in the standard 58-facet brilliant pattern, but again can have a varying number of pavilion facets ranging from four, six or eight. 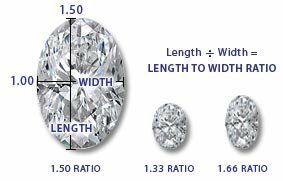 For oval diamonds that are pleasing to the eye, look for length-to-width ratios between 1.33 and 1.66. The pear shape diamond is a hybrid cut, combining the best of the oval and the marquise. The pear shape, like the marquise, usually has the 58 facet brilliant pattern, but can also be cut with different numbers of pavilion mains of eight, seven, six or four facets. The p[ear is particularly beautiful for pendants or earrings. For a pear-shaped diamond that is pleasing to the eye, look for a length-to-width ratio between 1.40 and 1.65. An elongated shape with pointed ends inspired by the fetching smile of the Marquise de Pompadour and commissioned by France's Louis XIV. The marquise (pronounced "mar-KEYS", not "mar-KEY") is usually cut as an adaptation of the 58-facet standard brilliant, with the crown having 33 facets and the pavilion 25 facets of the same type as the round brilliant. The Marquise is gorgeous as a solitaire or enhanced by smaller diamonds set in surround. This shape is used to maximize carat weight in the setting and give it a long, slender appearance. The length-to-width ratio is important to a stone's appearance, and for the marquise shape the preferred range is 1.75-2.25: 1.00. Marquise diamonds frequently show a bow tie, so try to find a stone in which this is minimal or absent. This shape of diamond in a ring accentuates the length of the fingers. The Heart shape is the ultimate symbol of romance and is essentially a pear-shaped diamond with a cleft at the top. Look for a stone with an even shape and a well-defined outline. The length-to-width ratio should ideally be 0.90 - 1.10. Because most heart diamonds are almost round, they can be cut similar to round brilliant cut for maximum fire. This shape is seen frequently in pendants, but is suitable for most any purpose. This square or rectangular cut combines the elegance of the emerald shape with the brilliance of the round, and its 70 facets maximize the effect of its color refraction. Because of the design, this cut also requires more weight to be directed toward the diamond's depth in order to maximize brilliance. Depth percentages of 70-78% are not uncommon. The radiant cut is called a cut-cornered, square/rectangular (depending on the overall shape) modified brilliant on GIA grading reports. It has 70 facets, 25 on the crown, eight girdle and 37 pavilion facets. This unique shape has been popular for more than a century. Cushion-cut diamonds (also known as "pillow-cut" diamonds) have rounded corners and larger facets to increase their brilliance. These larger facets highlight the diamond's clarity, so if you choose an SI clarity grade, be sure the table is clear of dark carbon imperfections. Cushion-cut diamonds are available in shapes ranging from square to rectangular. 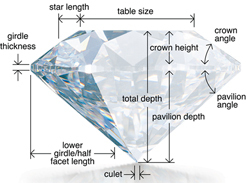 The length-to-width ratio will determine the diamond's outline, or what it will look like when viewed from the top. 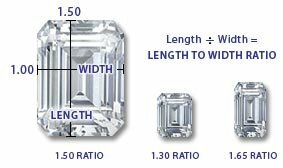 For a cushion-cut diamond that is square, look for length-to-width ratios between 1 and 1.05. If you prefer more of a rectangular shape, look for length-to-width ratios greater than 1.15. This beautiful shape diamond has been around for more than a century and is cut with a series of many parallel steps, creating a hall-of-mirrors effect when looking deeply into the stone. These steps create more internal refraction and diamond fire than typical step cut stones, such as the emerald cut or the radiant, making the Asscher shape an excellent choice for those wanting a diamond that is vintage and unusual but that still sparkles brilliantly.With the Asscher shape we do recommend a VS clarity or above, it is important to have a table clear of carbon imperfections, because this shape highlights the clarity of the diamond, and there is no where for the flaws to hide. The trillion is a triangle that has equilateral sides and is a combination of the step cut and the brilliant cut diamond, and when cut correctly, has a wonderful brilliance. They are often cut shallow and often look large for their carat weight. Trillion diamonds are beautiful when flanking a center sqaure diamond in a ring, or in a more avant-garde piece, as a center diamond. A matched pair also creates beautiful earrings. The baguette is a step cut style used frequently as side stones. Baguettes have unbeveled corners, usually only two rows of facets and may be rectangular or tapered. Like the emerald cut, the baguette does not have the sparkle of brilliant cuts but has a classic beauty. Higher color and clarity are important because there are no facets to hide inclusions or body color.